The first in a thrilling new four-book fantasy series from New York Times bestselling author Cinda Williams Chima, set in the same world as her beloved Seven Realms series, a generation later Adrian sul’Han, known as Ash, is a trained healer with a powerful gift of magic—and a thirst for revenge. Ash is forced into hiding after a series of murders throws the queendom into chaos. Now Ash is closer than he’s ever been to killing the man responsible, the cruel king of Arden. As a healer, can Ash use his powers not to save a life but to take it? Abandoned at birth, Jenna Bandelow was told that the mysterious magemark on the back of her neck would make her a target. But when the King’s Guard launches a relentless search for a girl with a mark like hers, Jenna assumes that it has more to do with her role as a saboteur than any birth-based curse. Though Jenna doesn’t know why she’s being hunted, she knows that she can’t get caught. Eventually, Ash’s and Jenna’s paths will collide in Arden. Thrown together by chance and joined by their hatred of the king, they will come to rescue each other in ways they cannot yet imagine. Set in the world of the acclaimed Seven Realms series a generation later, this is a thrilling story of dark magic, chilling threats, and two unforgettable characters walking a knife-sharp line between life and death. A High Fantasy knockout by Chima. 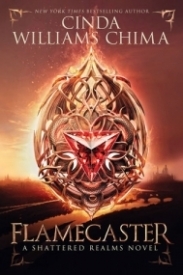 Flamecaster is filled action, adventure, magic, dragons and a good dose of romance. I highly recommend this to fantasy lovers and fans already familiar with Chima’s work. This high-fantasy knockout is sure to surprise everyone; I was very quick to assume this would be similar to every other fantasy out there but it’s truly one of a kind with it’s strong character driven plot, it's extremely well paced writing; giving you time to get to know and actually connect with the characters and the vivid world building. Flamecaster follows Ash and Jenna who live very different lives in two very different kingdoms but who have one common goal and that is to see the King of Arden’s head on a pike. Prince Ash is a famous healer posing as a pauper in order to seek his revenge and protect his family. Jenna was born with a magemark on her neck but she has no idea what it means but she soon becomes hunted and this strange mark will now cost her everything, including her life. What I loved about Flamecaster is that there wasn’t a big focus on the romance, it was all plot and character driven, in fact Ash and Jenna don’t even meet until the latter half of the book. I feel the build up to Ash and Jenna’s eventual face-off was written perfectly. Second generation! Hanson Alister is back. (In my mind, he is always Handsome Alister, but that's not the point of this paragraph.) Anyway, he's back. Sort-of. It is always nice to see a familiar face come back, even only for a few pages or so. The Grey Wolf Queen, on the other hand, shadows over the entire book with barely a cameo and a powerful presence. But we have to admit that the main characters of the previous series aren't as big as they once were (hello, they were narrators of the previous series). Instead, there's a whole new cast of characters. Three main characters, in fact. Each of them are unique in their own way with their own plot and character arc, but they are familiar enough to the previous trio and different enough to tell apart. Joining the trio of heroes, there is also a deadly villain. He is so deadly and dislikable that I just love to bash him in my head. He's a real piece of work to deal with, and he does pose a great amount of danger to our heroes. The world building builds upon what Cinda Williams Chima has developed in the previous series. Though she doesn't (re)explain everything, she does explain enough for the story to continually moving forward without doing too many info dumps. Though the book is indeed packed like a solid brick, the pacing is kept tight. Unsurprisingly, FLAMECASTER chugs along with the intensity of an adventure novel with fantasy, magic, mystery, danger, and a pinch of romance. (Let's admit it. It wouldn't be Cinda Williams Chima's novel without a romance.) It all meshes smoothly together. In conclusion, FLAMECASTER is a worthy start to a succeeding series. Based on a strong, previously established world, it will definitely be exciting for returning readers. And if you're not familiar with this series, that's okay. You can jump right into FLAMECASTER without reading SEVEN REALMS and still get the gist of it.